This floor sofa set contains 1 floor seating couch, 3 backrest pillows and 2 armrest pillows. Our versatile floor sofa sets make the perfect finishing touch, wherever you may wish to use them. TRADITIONAL MIDDLE EASTERN ORIENTAL FLOOR SEATING SOFA. This floor sofa set contains 1 floor seating couch, 2 backrest pillows and 2 armrest pillows. Our versatile floor sofa sets make the perfect finishing touch, wherever you may wish to use them. 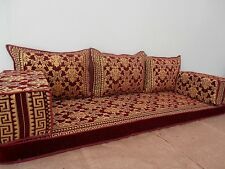 TRADITIONAL MIDDLE EASTERN ORIENTAL FLOOR SEATING SOFA. This floor sofa set contains 1 floor seating couch, 2 backrest pillows and 2 armrest pillows. Our versatile floor sofa sets make the perfect finishing touch, wherever you may wish to use them. Floor seating couch x 1. This floor sofa set contains 1 floor seating couch, 3 backrest pillows and 1 armrest pillows. Our versatile floor sofa sets make the perfect finishing touch, wherever you may wish to use them. TRADITIONAL MIDDLE EASTERN ORIENTAL FLOOR SEATING SOFA. This floor sofa set contains 1 floor seating couch, 2 backrest pillows and 1 armrest pillows. Our versatile floor sofa sets make the perfect finishing touch, wherever you may wish to use them. Floor seating couch x 1. This floor sofa set contains 1 floor seating couch, 2 backrest pillows and 2 armrest pillows. Backrest pillows x 2. TRADITIONAL MIDDLE EASTERN ORIENTAL FLOOR SEATING SOFA. Our versatile floor sofa sets make the perfect finishing touch, wherever you may wish to use them. Our versatile floor sofa sets make the perfect finishing touch, wherever you may wish to use them. 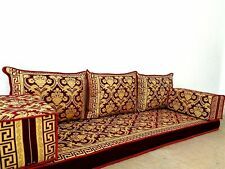 TRADITIONAL MIDDLE EASTERN ORIENTAL FLOOR SEATING SOFA. 190 x 70 x 10. 75 27 4. 45 25 25. ABD için tahmini teslim süresi, İngiltere ve Avrupa için yaklaşık 14 ila 18 iş günü / 7 ila 10 iş günü arasındadır.